My Name Is IRL: Shocker: Marco has speeding tickets! 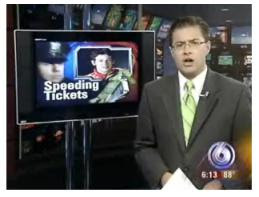 Shocker: Marco has speeding tickets! Let’s suppose you are a TV news reporter in Indianapolis, and you presumably would aspire to one day appear on the national evening news. You’re having a slow day until a sleepy story involving a celebrity appears on your desk. So what do you do with the story? Pass it on to the news desk for a three sentence mention, or start interviewing people for an in-depth investigation? If you chose the latter, then you might understand why you are still a reporter in Indianapolis. Check out how this “Call 6 Investigator” has “got the records right here” on this HUGE story. Oh, and what’s that big story? Marco Andretti forgot to pay a speeding ticket and briefly had his license suspended. Talk about unintentional comedy - this dufus is talking like he just uncovered an Al-Qaeda sleeper cell in Carmel. He might have been better served handing this segment over to The Colbert Report. That picture up on the screen over the reporter cracks me up! Ooh... Marco has been a bad boy! Go to my room! When that reporter was talking to the prosecutor, she had this look on her face like, "This guy is a complete tool." The reporter seemed very concerned about Marco getting special treatment. I hope his next story will be about the countless number of people who 1) speed on I-465 and 2) forget to pay tickets and yet—miraculously—DON’T get a news exposé filmed about them. Where’s their special treatment by Channel 6? Slow news day in Indy, evidently. But...but...but...it's Channel 6 ... they're the WKRP of Indianapolis stations. You're dealing with "Les Nessman" ... you expected more from Les?